Carrie: Talk to us honestly about how to proceed safely if we’re not at all flexible, but are deemed healthy enough by our doctors to give yoga a try. Are there are few very simple poses that we should work on and master before moving on? Or is it better to try a larger range of poses and get more variety in our use of different muscles? 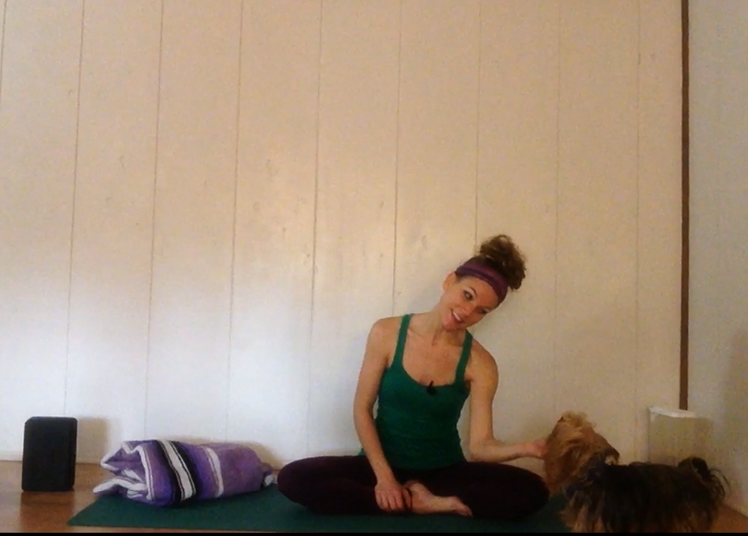 Assuming we work out daily for a short time, how long should we expect to do this before we begin to see some improvements in our ability to go deeper into the stretch, while enjoying the process enough to include our dog? That’s important to many of us, so please help us figure this out. We also want to use this workout to bond with our dogs. JESS: Thanks for asking about getting your doctor’s approval—very important. There are very few medical conditions that would contraindicate the practice of yoga entirely, but there are many conditions which would limit the number of poses that would be considered safe for your body. Learning what body parts you need to protect and how to do so is partially your doctor’s job, partially my job, as an instructor, and partially your job, as a student. After all, you are the one who should be able to know what feels good and what doesn’t feel good, better than anyone else can. You should also ask your veterinarian to assess your dog’s health if you plan to use him or her in poses as an added weight. I have provided a blog on my yoga website for the sole purpose of helping beginners understand which poses are beneficial for which purposes, and which poses should be avoided with certain medical conditions (i.e. back injury, carpal tunnel syndrome, arthritis, migraines, etc.) In addition to using this resource, always remember to work within the range of what feels good. This, of course, requires us to be in tune with our bodies, listening to what it’s telling us throughout the duration of our practice. If there is even the slightest bit of pain with the practice of a certain pose, that’s your body’s way of telling you that it doesn’t like it and you need to either back off a little, with the use of props and modifications, or you just need to pick a different pose altogether. Also keep in mind that sometimes, our bodies just need a little extra time to get comfortable in a pose. I suggest starting a pose with a modification option first, with the use of props (like a chair, blanket or pillow, for example), take a few deep breaths, then try moving a little deeper into the pose and see if it feels good. Keeping your focus on the rhythm and quality of the breath will help your mind stay in tune with what your body is telling you, thereby increasing your body awareness, which will ultimately help us avoid injury during our practice and in our everyday lives, as well. All of the poses on my blog are beginner and intermediate level poses, so the poses presented on my site are a great place to start for those of us who are completely new to yoga. If there are poses you want to try that you have never practiced before, and you don’t even know where to start with them, I have provided links to yoga instructional demonstration videos for each pose presented on my blog, for free viewing on my YouTube channel at the link. Sometimes seeing a pose in action can be very helpful in your own practice. 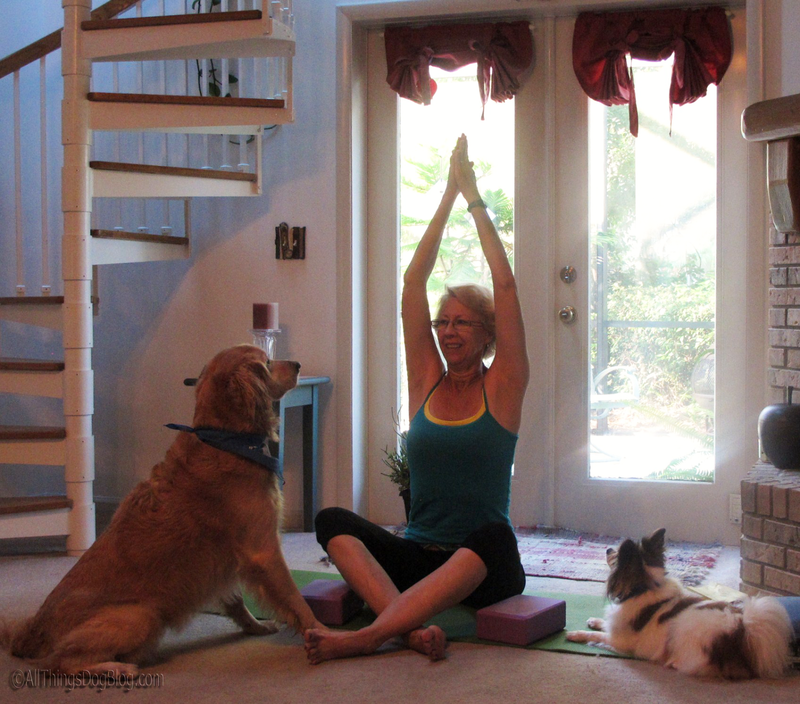 As you work through poses that are comfortable for you and make you feel good about practicing yoga, invite your dog to join you! Offer affection, praise and an occasional, healthy treat to encourage his or her participation on the mat. Always praise your dog for joining you on the mat and eventually your pup will consider it to be a safe place to join you, which will, ultimately, strengthen your bond. To get you started, following are some modifications from the yoga workout we created. You'll want to be sure to view the instructional yoga videos first. These can be found at this link. Dogs Love the Child's Pose--Let them Join You!